Frobo is an initiative by hobbyandyou team to help children learn basic concepts of electronics, crafts and programming. We earnestly believe in improving learning abilities by context based education. Frobo is a modular teaching based toy craft programme. We will be happy to work with education professionals and schools. This is the beginners craft kit aiming at teaching model building skills with basic electrical knowledge of voltage, current, resistance, load and conversion of energy into light, sound and motion. This craft kit is meant for children above 8 years. This module will help improve the following skills. This kit is also for beginners with additional components. 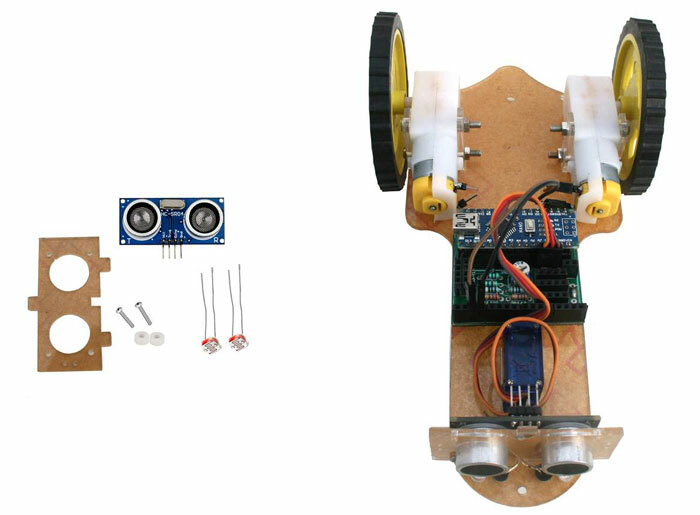 This kit becomes the platform for kids to add programmable micro controller with sensors. 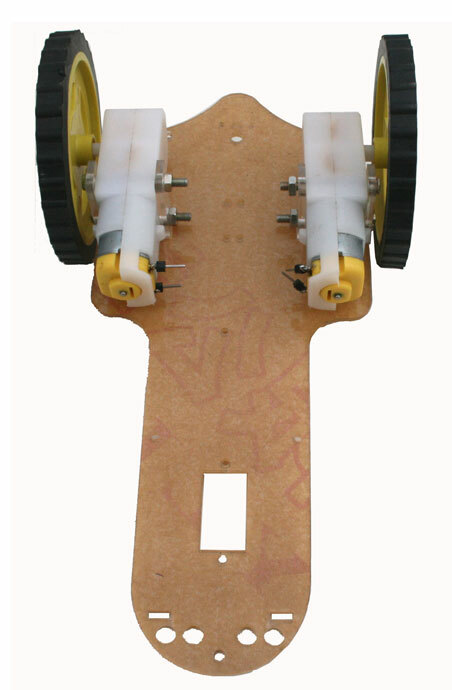 This model will allow kids to understand concepts of motion in greater detail. 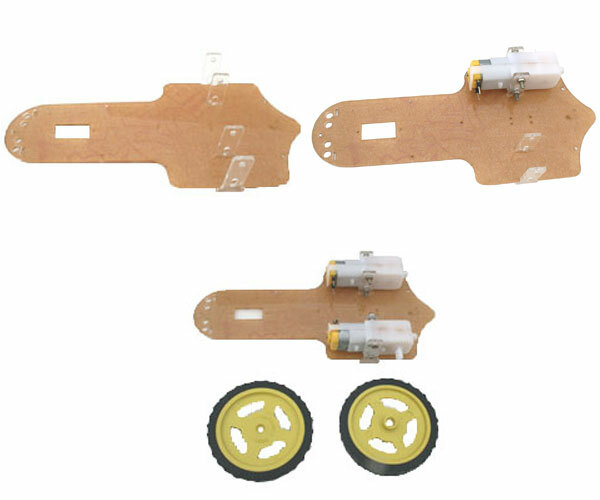 We created this kit as an intermediate after they have become familair with basic concepts of model building and electricity. This kit is a perfect choice for kids above 8 years. This add on modular kit is for those who have assembled their V2 model and are now ready to start their first lessons in controlling the Frobo. This is foundation training in programming in arduino- the robotics most popular platform. This module provides a comprehensive training in connecting and programming different kinds of sensors and motor control methods. We strongly believe that children need to relate to what they are being taught. This training will enable them to improve the following. 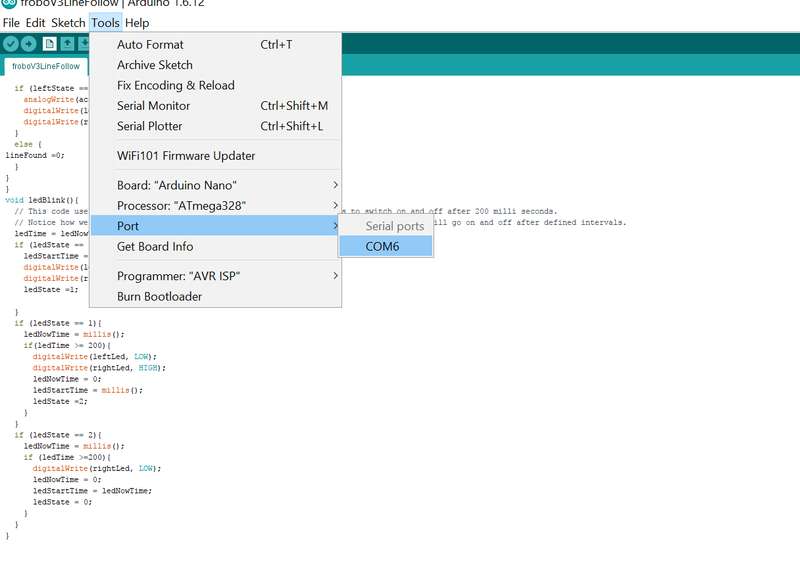 This module is a comprehensive package for learning basic to advanced arduino programming and hardware configuration. We have designed step by step instructions to guide children to learn basic programming and then slowly challege them to do more complex tasks. We designed this module to augment understanding of everyday technology, we all use but know little about. This part will help stimulate creative genius of kids and will prepare them to think beyond boundaries. Frobo team is contantly working on more advanced training modules to help children realize their potential and help them discover themselves. 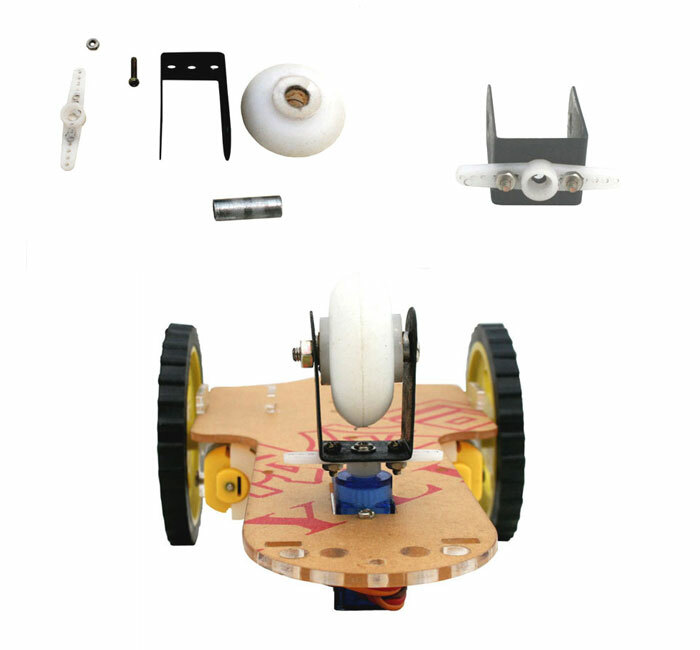 Frobo V2 is a comprehensive robotic educational kit for kids above 10 years with basic knowledge of computers. We first begin with asembling the Frobo mobile car V1. It is easy to mount the motors on the lower frame. It is done with the help of a pair of motor-holders for each motor. There are 4 slots to insert these holders in the broader rear part of the lower frame. 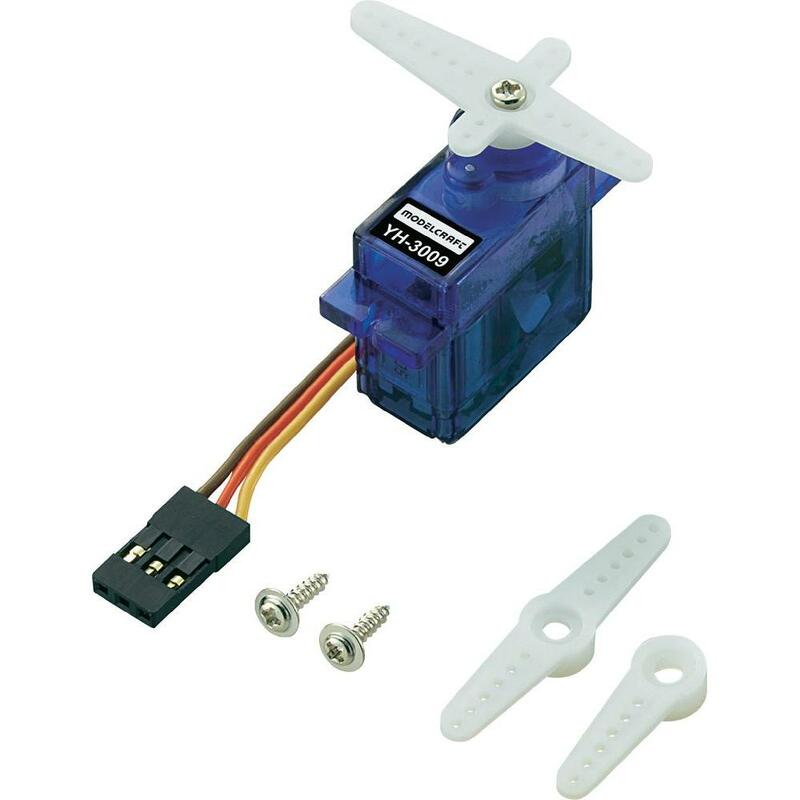 After inserting the holders and placing the motor in between them, use two screws to fix each motor. Please see the pictures. Once the motors are mounted, wheels can be fixed on the shafts extending outwards. Mount the control circuit PCB with screws and nuts on the lower frame. There are four holes of about 5mm each about 2cm from the front end of the lower frame. One IR diode and one photosensor are to be inserted one each side. These need to be inserted from below the frame. Please see picture. 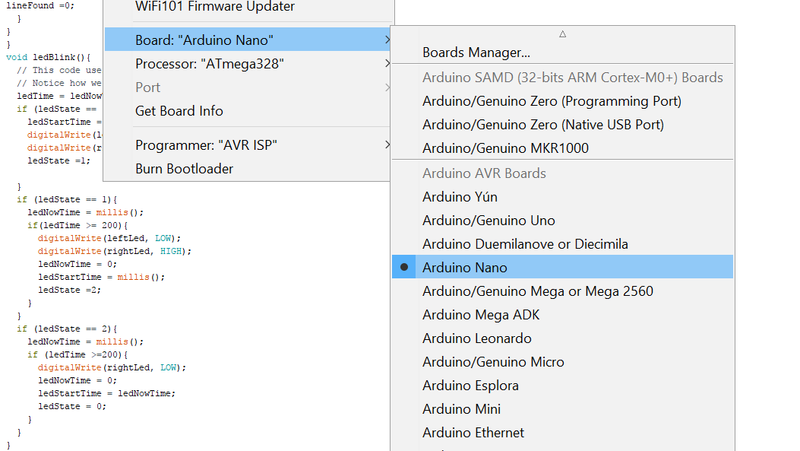 Join the Arduino Nano microcontroller with the help of the 30 PIN adaptor to the included PCB—as per the given diagram, so that micro controller is connected properly. It should be fixed in correct orientation. If you fix it the other way, micro controller will not work. Take the upper frame and glue the frog theme sticker on it carefully. A total of 7 LEDs need to be fixed on the upper frame. 2 green LEDs in the front, and 5 (2green+2red+1yellow) LEDs in the rear part. Further, 1 IR diode and 1 photosensor are to be fixed in the centre of the broader part of upper frame. A total of 9 holes are provided in the upper frame for this purpose. Mounting the front castor wheel along with the servo on the lower frame is the next step. As per the image given below, first fix the small white plastic strap with the black U-shaped metallic holder for wheel. Now, the white wheel should be fixed to its holder with the nut and screw provided. This assembly will be fixed to the lower frame from below, while the servo will be attached from above. Both these will be fixed on lower frame with the help of a single screw. 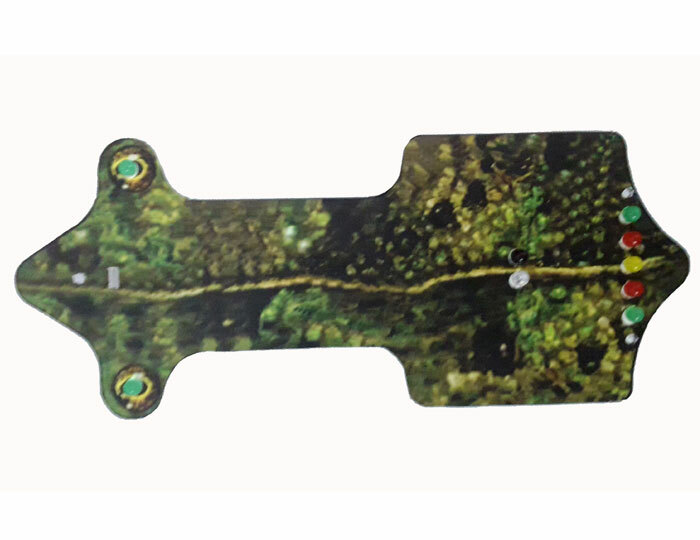 Now, ultrasonic sensor is to be fixed—with the help of 4 small screws—on a small rectangular piece of sheet provided (the back locking plate). The 2 CDS sensors (LDR) are to be inserted one on each side of this sheet—tiny holes are there. This rectangular frame can then be inserted on the front end of the lower frame with the help of two tiny extensions to match with the tiny slots. A similar tiny extension will fit in the corresponding slot on the upper frame when we place the upper frame on the lower frame. But it will be done after wiring is done. The upper frame will join the lower frame with the help of 3 brass spacers. One screw on each end of every spacer will fix the two frames together. It is now time for understanding the programming part. We will start learning in parts different programming modules for different sensors and motion types. Please see the wiring diagram below for clear understanding. Correct wiring is very important for the Frobo to function properly. Connect Red left motor wire to '+ve' "M1" port and green to '-ve' port. Doing it in reverse order will make motor move in opposite direction. Similarly, connect Right motor wires to port "M2". Connect Servo Red, green and orange wires to "S" port '+ve', '-ve', 'O' respectively. Connect left led Red and Green wires to "L1" port '+ve' and '-ve', and right led to L2 port. Connect buzzer Red and Green wires to "B" '+ve' and '-ve' ports. Connect left CDS sensor Red, Green and Orange wires to "C1" '+ve', '-ve', and 'O' ports and right CDS to "C2" respectively. Connect IR diode Red and Green wires to "I" port '+ve' and '- ve' and Photo sensor Red and Orange to "P" '+ve' and 'O' ports. Connect battery terminals Read and Green wires to "PW" '+ve' and '-ve' ports. The micro controller come pre-programmed with wiring test. Just take our micro controller from arduino Uno development borad carefully and fix it on the 28 Pin adaptor on the control PCB. Fix Motor driver IC 293D (14 Pin) in 14 pin adaptor and Op-amp LM358 (8 Pin) in the adaptor respectively. This wiring test program checks if your wiring is correct or not. Please observe carefully. If the steps listed below do not show as stated, check the wiring and try again. In case of persistent problem, contact customer_service@hobbyandyou.com. Slide the switch on and wait 2-3 seconds. The leds will flash in sequence along with buzzer. Now, after led flashing, left led will glow and right will turn off and left motor will make forward and backward motion. Your left motor is connected right. The same sequence will reapeat for right motor. After motor tests, both leds will start flasing alternately and servo will move left and then right. Your servo wiring is right. Now bring your hand right 6 inches in front of the ultrosonic sonar. The leds will glow bright. It means ultrasonic sensor is reading your movement. Now bring your hand 2 cms near the Ir Photo diode. Both the leds will flash together. It means IR photo sensor senses your hand. Cover left CDS sensor on the front cover with your finger, the servo will move left side and cover the right CDS sensor and servo will move right. After testing the wiring, You are now ready to experiment with your first Arduino program. Hope you are enjoying this series of Froboduino/Arduino tutorials. In this Frobo V3 programming lesson Part 4, we will look at LDR CDS Photosensor closely. LDR is light dependent resistor. CDS LDR sensors have been around for a while and are widely used by robotic and electronic hobbyists and professionals. These sensors use a special property of cadmium sulfide to change its electrical resistance when light intensity changes. We measure this changing resistance using what is known as "voltage divider circuit". 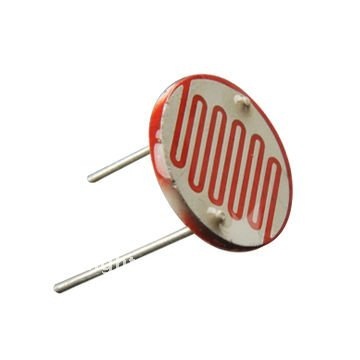 We connect another fixed value resistance in series with this sensor. When connected to power (5V), with the change in light the LDR sensor resistance will change causing current ampere change in circuit. According to"Ohm's law" when resistance in circuit changes, the current flowing will change in inverse proportion. Where V is supply voltage, I is current in ampere and resistance in "Ohms ( A unit of resistance named after German scientist Georg Simon Ohm)"
Look at the typical voltage divider circuit. In the electronics world, we can't directly read current(amperes), but can read voltages. 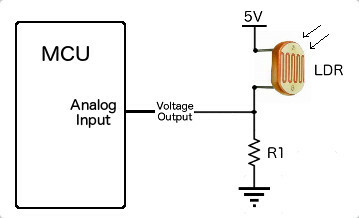 A voltage divider circuit helps in reading changing current as a changing voltage across a variable resistance when another fixed value resistance is attached in series. When light intensity changes, LDR resistance changes inversely. With this change overall resistance of circuit changes. With change in total resistance, the total current will also change as per Ohm's law as power supply voltage is constant. For two resistance in series, the current flowing through both is the same. 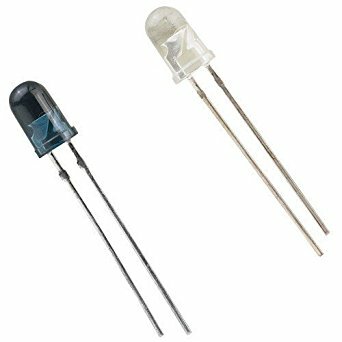 if light becomes brighter, LDR resistance changes from 3000 to 2000 Ohms. We use this difference if voltage change across Rf to measure light changes and use it in our application. 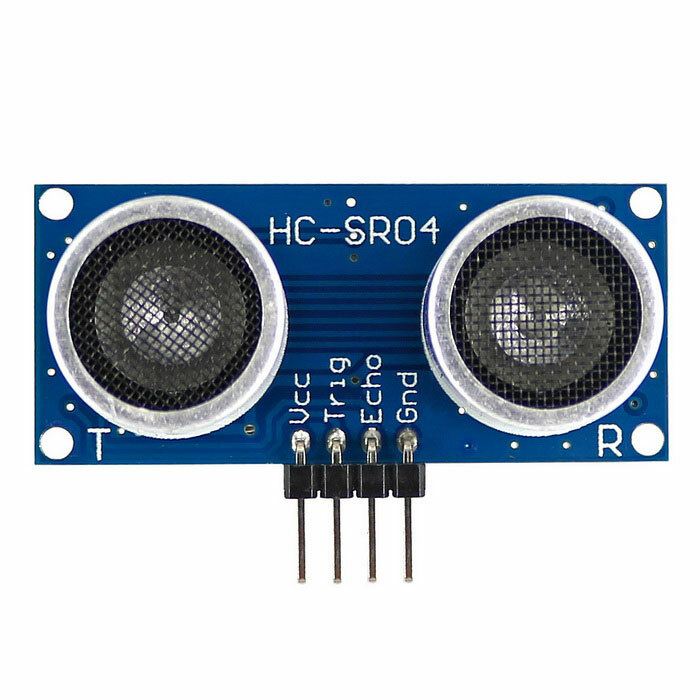 Let's write our froboduino code for reading values from LDR sensor with changes in ambient light. /* On your froboduino board, connect one of the LDRs to LD1 +ve and -ve ports. LDR is non-directional, so you can put any leg to +ve or -ve. // Froboduino analog reference voltage is 5V. // Analog pins read voltage between 0 to 5V. Arduino 328P has an 10 bit analog to digotal converter (ADC) on 6 pins from A0 to A5. // Let us convert ldrValue to voltage. We will use "float" variable for the decimal value. // We use Characters within "Characters" in Serial.print to show characters in serial monitor as "Characters"
Copy the code above and paste it in Arduino text editor and upload to froboduino as explained earlier in programming lesson part 1. Now, Let us try to use LDR sensor in our Frobo to do something useful. We will use two LDR sensors, mounted right in the front. How about making Frobo follow light! Can you imagine, how we can do that? There are two LDRs hole mounts in the front part of Frobo. See picture. Connect the left LDR legs to LD1+ and LD1- and right LDR legs to LD2+ and LD2- ports on the Froboduino board. We will compare the light falling on each LDR and use left and right LEDs to indicate the direction of more light. Interesting! isn't it! Here is the Froboduino/Arduino code for making a light indicating robot. // Setup code runs only once when program starts. // Let us try to do something useful with light reading of both LDR sensors. // LDR value goes down when it sees more light. // this code will light up left Led if value of left LDR is lower. //Frobo will turn where it sees more light, until both LDRs start getting close enough values. //Frobo sees more light on left side, so we will turn servo wheel leftwards. // this code will light up right Led and turn right if value of right LDR is higher. //Frobo sees more light on right side, so we will turn it leftwards. // this code will light up blink left and right Led if value of both LDR is almost equal. //Frobo sees almost equal light on both side, so we will it forwards. Copy and upload this code in your Froboduino and test it by flashing a torch. Is your Frobo now seeing light? We are excited to see you bringing more and more sense and action to your Frobo. It will get more and more exciting from here onwards. Our Frobo is now doing multiple tasks all at once. It is time that we learn to make it even smarter. In next lesson, we will combine a few more features to make Frobo a great robot. If any questions, please write in comment section below. We hope that you have understood how to read sensors and control some output devices with Froboduino/Arduino programming. This is now time for you to jump to the next level of professional programming methods. Now, your Frobo is connected with an Obstacle sensor, IR colour contrast detection module, light sensing LDRs, Motors, Servo and Led lights. For now, this is enough to make Frobo perform a few composite tasks. Let us define the functions that we want Frobo to perform. You can come up with your own functionalities later and develop code. We will use all three sensor inputs and all output devices attached. The next code will enable Frobo with the following capabilities. 1- When light goes below a certain level, Frobo will stop moving and its eyes will blink with slow rate. 2- When light is normal (normal? ?, we define what is normal in our code by minimum LDR value), Frobo will move inside a circle drawn with black electrical tape or marker on the floor. 3- When Frobo senses the boundary, it moves away from the line. There are three conditions, in which Frobo wil approach the line. A)- When it approaches the line at an angle from left side. B)- When it approaches the line at an angle from right side. C)- When it approaches the line straight. 3- If Frobo detects obstacles from 3000 cms, Frobo creates a sound and approaches the object and and stops when distance is 300 cms. Try coming in fron of Frobo at a distance of 3000 cms( 3 meter) or less. Start walking away and Frobo will follow you. 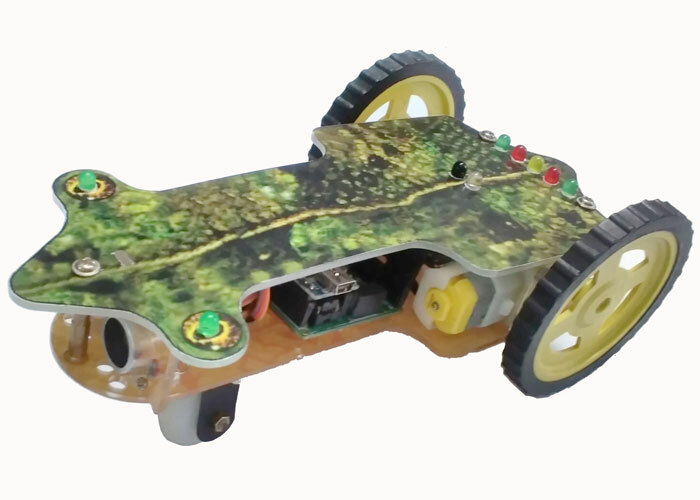 4- Frobo will blink eyes and create sounds in different patterns to various sensor inputs. So, let's get coding. Please read comments after "//" or between "*/ /*" to understand the part of the code. //declare inputs and output devices. //Declare variables we are going to monitor. // Declare left and right Led States for controlling Leds. //We declare another set of variables to decide if Frobo moved over the boundary line. // This one if Frobo dtected line on left side. //This one if Frobo dtected line on right side. //Her ewe declare detect time variables as unsigned long types. //We will define these variables in the code. // Define buzeer, LEDs, Motors and Servo as outputs. Inputs are defined by default. // This code runs repeatedly. /* Note down LDR values in different directions when light is on and repeat the same by turning off the light. LDR values go up when light is low and lower when there is more light. we will use the highest value when light is on as a threshold value to make Frobo to sense when light is on and when it is off. //Remove "//" from next line when taking LDR values.so you can record LDR values in Serial monitor for easy reading. /*When light is off. We will see if ldrValues are higher than the minimum we recorded. * Frobo will move only when lightMode =1. * We are taking 300 here. Replace it with your recorded minimum. We will change int lightMode to 0. //Program will run the below modules repeatedly. // We write these programs in different modules separately for easier programming and debugging. // The code below is to program Frobo to remain within the boundary drawn. //Read IR diode state to check if Frobo sees the boundary. // If there is enough light. // Frobo keeps moving forward. Both motors move forward. // If both IR diodes sees line, move Frobo backwards and then turn left (or even right as you like but change code for right turn). //Take time reading when line was detected. // Turn left motor backwards. // Turn right motor backwards. //Line found. So, we change the lineDetect to 1. // We close the statement here as lineDetect state has changed. // Take current time since detection. // Declare detectOnTime as time difference since line was detected. // Now we want to Frobo to move backwards for 5 seconds (or you can decide) and then move forward while turning left. // Turn left motor forward. // Turn right motor forward. // Turn servo back by 15 degrees after 3 seconds more. // If right IR diode sees line, but left doesn't. Turn Servo left by 15 degrees for 5 seconds. //Turn servo back by 15 degrees after 5 seconds. // If left IR diode sees line, but right doesn't. Turn Servo right by 15 degrees for 5 seconds. // This code will control Leds in a way so that Leds are On for 1.5 seconds and off for 100 mili seconds. Showing fear. //This code will run only when light is normal and both IR diodes step on boundary. //We use tone(pin, frequency) function to sound buzzer. Our buzzer is at pin 0 and frequency we have chsen here is 440 Hz. //Here we use noTone(pin) to silence the buzzer. //This code will control Leds when light is normal and when Frobo sees line on the left. //We will light up right Led in this mode and blibk left. // This code runs whenFrobo see line on the right IR diode. //We will light up left Led in this mode and blink right. // This code runs when light level goes below normal. // This code lights up both Led for 100 mili seconds. // Let us sound the buzzer using tone() function. //THis code keep Leds off for 80 mili seconds. //Keep Leds on for 100 ms.
//Keeps Leds off for 500 ms to create a Heartbeat kind of blinking effect. Copy and pastre this code in IDE dialog box and compile for any errors. Take note of LDR values and add the minimum value when Light is normal you note and change it accordingly in the code. Please read the code carefully. Please ask questions in "Comments" section below. If you have successfully completed your training so far, you are already on your way to handle more complex tasks, you can create for your Frobo. Try writing a program on your own for the following functions. 1- Frobo moves along the boundary when it see the line. 2- Frobo avoids the obstacle on the line and then tries to find the line back and follows it. This is your first challenge on Froboduino. Let us know your questions and progress on this challenge in "Comments" section. Electricity current is created by the constant flow of electrons in a metal when a voltage potential applied across two points in the metal. When you switch on the lights of fan in your room, the electricity starts flowing and lights glow bright. This happens because the switch connects the lights to electricity circuit and electrons start flowing in the wires and powers the light. Do you waonder how electricity can create light in the bulbs and can also rotate the fan. How does this happen? The answer is that Electricity is a form of energy and it converts one energy type to another in different ways. For example, the light is one form of energy and fan rotation is another form. We take all everyday things without even knowing how they work, but it took engineers and scientists a lot of efforts to understand and create the everyday gadgets for comforts. Do you also want to learn how things work? Let us begin learning and share what you already know. Let us try to define a few things here which you will notice appearing repeatedly when you read about electricity. Alessandro Giuseppe Antonio Anastasio Volta (Quite a name it is, Isn't it?) was an Italian scientist. He was born is 1745 (That's more than 250 years ago). This important unit 'Voltage' or simply 'Volt' of electricity is named after his contribution to the field of electricity. Imagine the overhead water tank at your home filled with water. When you open the water faucet, the water starts flowing. Way does the water flow from the tank to your faucet? This is because, the water in tank is situated at certain height from the ground, therefore, it has some amount of potential energy. When you open the water tap, the water from higher potential energy starts flowing to lower potential energy. That's a fundamental law of nature. The energy always flows naturally from higer potential to lower potential. Similarly, electricity also flows in the same way. As you apply higher voltage potantial between two points in a metal conductor (Wire), the current starts flowing from higher to lower potential. This potatial diffrence in electricity is called "Voltage" or "Volt".